ENCINITAS — The Encinitas Mile is back — all 5,280 feet of it — for the second year in a row. And the sight of running feet covering that mile might look even faster this year when they hit Vulcan Avenue March 15. With an upped prize purse of $2,000, race co-founders Dan Seidel and Mark Sarno are looking draw a faster field of elite racers. This year’s race will feature the first sub-four minute runner in John Simons of North Carolina, who’s personal best time is three minutes 59 seconds. “The elite fields, on both the men’s and the women’s side, will be faster,” Seidel said. Encinitas resident Gina Merchant will be running in the women’s elite bracket again this year. Admitting she’s not a professional runner, Merchant said the whole point of running against them is to compete. “You’re in this race with these people who are really fast and so I’m hoping to drop a good 10 seconds off my time last year just based on the field being really competitive,” she said. Merchant finished last year’s mile with a time five minutes and 13 seconds. What race organizers are hoping to see at the race this year is a mile done in 4 minutes and 10 seconds or quicker. “It’s always important for elite runners to know that there’s going to be a fast time and a chance to compete against fast runners. Last year, the race was won in 4:20, and that was fantastic, but we think, because of the course, we can make it quicker,” said Seidel. Elite racers are exciting to watch because they can inspire everybody to see what’s possible with commitment and training, he said. About 500 runners are expected in the seven heats of the race, and as last year, spectators will be able to watch most of the race unfold start to finish, seeing some excellent runners and a chance to cheer on friends and family, Seidel added. “As a community of runners, we don’t have opportunities to race a mile distance on the road, which is what makes it so exciting,” Merchant said. The nonprofit Fresh Start Surgical Gifts, which helps to provide reconstructive surgery to children with deformities, will receive a portion of the proceeds from the race. 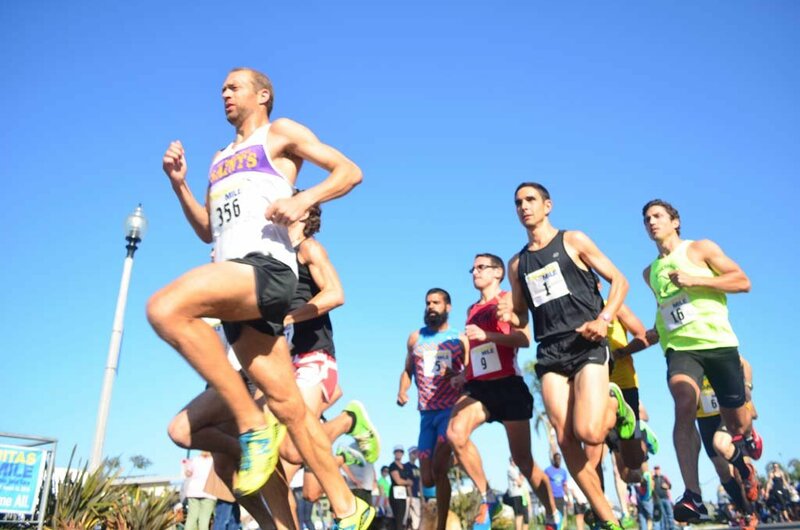 The race will also serve as the 2015 USATF San Diego Road Mile Championship. Steve Scott, a former record holder of the fastest mile, and current track coach at Cal State San Marcos will be back as a guest of the event. Part of the goal of the race is to continue the call of bringing back the mile, a nationwide movement to keep the mile distance in the culture of American running. The movement is gaining steam around the country, Seidel said. “It’s a distance that is at once challenging and doable,” he said. Register online at encinitasmile.com until March 14. Registration will also be available the day of the race.